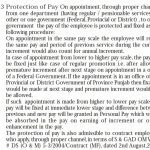 I will explain the full procedure of fixation of pay on promotion within the same scale with the reference of Finance Division (Regulation Wing) Islamabad notifications. Here is to mention that the employee who is promoted within the same scale will get 2x increments, 1x Next Above Increment and the other one is Premature Increment. The next above increment was already in vague and premature increment on promotion within the same scale is allowed vide Finance Div Notification No. F.11 (30) R-2/2010-1180 dated 5th November 2012. Here is to mention that the Premature Increment on promotion within the same scale was granted by the Finance Division O.M No. F.2 (8)R-I(1)/80 dated 17-11-1991 and the same was stopped by the Auditor General Pakistan vide letter No. 164/R-I/14C/87KW/267 dated 26-08-1996. What is Promotion within the Same Scale? I think many employees don’t know “what is promotion within the same scale”. I will illustrate you with example about the same. Suppose an employee is working as LDC (SG) BPS-09 and his/her next promotion is UDC that has also the same scale BPS-09. In this situation the promotion of the employee is within the same scale i.e the employee before promotion was in BPS-09 and after promotion he/she is also in BPS-09. The second example of the same is that Supdt in some departments is in BPS-16 and his/her next promotion is Admin Officer (BPS-16). In this situation the employee also promoted in the same scale i.e before the promotion the employee was in BPS-16 and after promotion he/she also got the same scale BPS-16. How to Fix Pay in Promotion within the same Scale? The Federal Government of Pakistan has allowed two move up to the employees of BPS-1 to 4. Due to this a Naib Qasid of BPS-1 has been placed in BPS-3. Now a Naib Qasid who is drawing pay in BPS-3 is promoted as Daftri in BPS-2. It is confirm that he will get only one increment of BPS-3 but the department is going to fix his pay in BPS-2 at Next above stage and on arbitration desired to provide a reference to any rule in this regard. 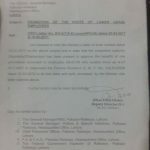 The Finance Department Punjab has issued a Notification No.FD(SR-I)1-8/76-Vol-II, dated 29-04-1984. Would you please help me by giving a reference of any rule in this regard of the Federal Government. Yes plz share here the details. Date of permotion 01 -09-2017 in scale 16. Assalamualaikum, sir I am working in Directorate of Labour Sindh as a senior clerk. Sir in our department assistanto 80% & stenographer 20% quota for the post of promotion superintendent (bs:17). There are only 3 posts of superintendent, sir what is the criteria /method or how to divide these 3 posts in according to 80% & 20% quota. Health department mai Paramedics 09 scale mai appoint hote te Lakin 11-8-2015 ko post upgradation k baad appointment 12 scale ho gaya. Mujhe option k zrye 01-12-2015 ko Bps 09 mai increment dae kr 12 scale mai upgrade kiya giya. Ab mai pay fixation k bare Mai pochna chahte hun. 30-11-2015 ko meri basic pay 9500 ta aur stage 3 ta. Ab. Aur January 2016 se Basic pay Bps 12 mai 10355 aur stage 2 lagaya. Kya ye fixation sahi huwa hai ya nahi agr nahi to mere sahi pay fixation kaisa hona chahiya. A person who was granted slection grade from B 5 to B 7 as L.D.C on 20.09.1987 & further he was promoted from LDC B.7 to UDC B.7 on 28.4.2000 (promotion within same scale) & his pay was fixed @Rs.2695 as LDC B.7 to @ Rs. 2695 as UDC B.7 (Rs 2695 was last stage in B 7)..
Let me guide wheather he is eligible for next stage + increment on above promotion or not if yes how ? the person who is on the maximum of a pay scale and promoted in the same scale how two increments are allowed to him in fixation of pay. Dear zafar qazu, he will be granted 2x personal Pay (PP). I am working as UDC (BPS-09) till 25th Feb' 2016. Later my department promoted my from UDC (BPS-09) to Accountant (BPS-08) (I know you are in shock that this is promotion or demotion). In Military Lands & Cantonments Department the post of Accountant exist in BPS-08 till now. Kindly guide me whether i avail benefits of new upgraded post of UDC (BPS-11) or not after my promotion. It is pertinent to mention here that I have not availed benefits of same scale increment till todate and drawing old pay. 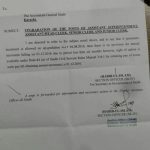 I have joined a provincial department (BPS-07) through proper channel from a federal department, The basic pay which is fixed is Rs.18,910/- and last month our current post has been upgraded to BPS-09, I need to ask a question about the increase in my basic pay, my basic pay is already higher than the initial basic pay of BPS-09, the basic pay of my colleagues (Fresh Appointees) will be increased up to Rs.1,500/- with this their basic pay is fixed from 7749 to 9260 etc. My Question: May i get get the difference of increase of basic pay? AoA. My Scale is 15 and Basic pay is 25465/= after availing the annual increment on 1.12.2015. Please guide me what will be the Basic now for Scale 16 from 2.12.2015, and what about premature? More, Scale revised also from 1.7.2016.. so what will be Total arrears including Oct. 2016. A person having two years service in bs 16, resigned and joined bs 14. What will be the procedure of his pay?? 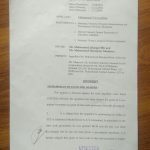 - my present BPS 23860. tell me total gratuity and per months pension. - i have passed my FA exam in 1986 and i was promoted as stenotypist on 05-01-1991 (now i m in SG - 14), in the light of my present Basic pay pl tell me two FA increments are included or not in my present basic pay as 23860. Dear Aziz just see ur service book, the detail of the same would be mentioned in the service book. Madam, Prior to upgradation of post of LDC, i am working as LDC (BPS-7 by Selection Grade) after upgradation of post of LDC from BPS-5 to BPS-07 i am working in same scale or like as same scale promotion. My department only allow me one pre-mature increment rather than my pay fixed in next above stage + pre-mature increment, Please advise me my fixation made by my department is correct or wrong. Dear Tariq Ahmad Khan ur fixation is wrong. U can email me so that i send you the copy of the fixation of a person working in FG. Plz also mention ur department in the email. I am EST(V) teacher. I have got scale 15 from 14 in C.M package in 2010. I know there is no premature increment in C.M. package for Punjab teachers. In scale 14 my pay was 14040/= at that time. In scale 15, there was same stage 14040/=. So, my pay fixed at the same stage means 14040/=. Would I had right to get next stage of pay because of same stage fixation or zero benefit after getting higher scale. please tell me about this situation. Thanks. With best wishes. Dear Riaz Mahmood, if the same stage comes then the next stage is counted. Your pay will not be fixed Rs. 14040/- u can add one more increment to it i.e next stage. AOA,main nain 1994 main selection grade BPS-12 say BPS-15, main hasil kia ,pher feb-2002,main moveover BPS-16,and back to BPS-15, under the notification issued from the Govt:and than now upgraded my post from BPS-15 TO BPS-16 FROM 23.12.2011,and retired on.1.4.2012,kia main jis main main premature increment nahi mila,ab batain,kay main sirf 1 increment ka haqdar hoon,ya 2 increments. 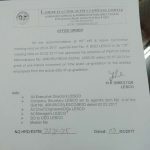 Regular Promotion in BPS-18 on 1-12-2000, pay was at maximum stage. Earlier Selection grade in BPS-18 was granted on 3-4-1994. Since no stage available in maximum pay scale as such no next above or premature increment was granted at time of promotion i.e 1-12-2000. Mover Over in BPS-19 was allowed on 1-12-2001. Deferment in pay fixation can not be allowed. Preemptive pay fixation after grant of selection grade or premature increment as per recent decision of Supreme Court orders of within pay scale is applicable or not. How this pay fixation with existing rules can be fixed to get benefit of promotion please. Thanks. Dear salim Azad, I think only the notification of Usual Increment beyond the maximum of pay scales stages may be helpful in this regard. Dear Ashok, you are eligible for premature increment in this situation as well as the next above. thanks for giving the information. please can you just let me know that my pay is 7250 on 1.8.98 in the feeder post what will be my pay fixed after premature increment of 175 it will be 7425 and next stage is 7600. will it be fixed at 7600 and also if possible the OM NO. in this connection . thanks.k. Dear Ashok, Plz mention ur date of promotion and Basic Pay Scale before and after promotion as well as ur pay. Will someone provide Government policy on Shaheed Policemen. Whether the legal heirs of shaheed policemen get 75% family pension or 65% pension. sam scale may promotion ka keya matlab hay? Dear same scale promotion has been in detailed explained in this topic. 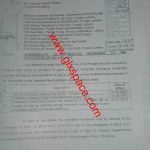 Dear u ll not get the annual increment unless ur special permission is not granted by the notifying authority. Dear u not mentioned the date of ur upgradation. Plz send e ur full detail at mine email. question is this that at what extent the gratuity is to be paid? These are re-employed persons and got retired at the age of 60years from University service as they were employed on regular basis. Punjab Government rules are prevailing in university (Autonomous Body). Further quries will be shared after this. Waiting for comprehensive response from you. Contact if required will be provided to you.